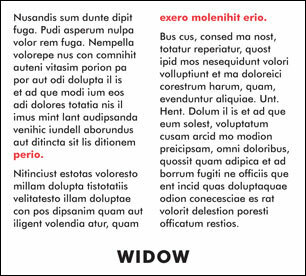 A widow is a word or two stranded alone on a line at the end of a paragraph or the last line of a paragraph that is carried over to the following page or column. An orphan is the first line of a paragraph that appears alone at the bottom of a page or column and separate from the rest of the paragraph on the following page or column. Sometimes, a little simple editing can eliminate widows and orphans, making your text look more professional.